Transparency Market Research has published a new report on the global companion diagnostics market. As per the report, the global companion diagnostics market was valued at US$1.8 bn in 2013 and is predicted to reach US$5.6 bn by 2019. The report, titled ‘Companion Diagnostics Market - Global Industry Analysis, Size, Share, Growth, Trends and Forecast, 2013 - 2019’, states that the global companion diagnostics market is expected to expand at an 18.10% CAGR during the period between 2013 and 2019. Companion diagnostics assist physicians to make accurate and precise decisions regarding the enhancement of particular drug treatments on the basis of how a patient responds to different stages of the treatment. Tests help determine adverse or favorable reactions to a specific line of treatment and help optimize the dosage of drugs. The global companion diagnostics market is primarily driven by factors such as increasing demand for personalized medicine and increasing need for higher drug efficacy. Personalized medicines are available in plenty in medical stores and are targeted towards specific patients. High costs of drug research and development campaigns are expected to increase the need for planning cost-effective personalized medical solutions. Companion diagnostics offer accurate insights about various issues associated with different drug treatments. Pharmaceutical manufacturers, therefore, concentrate on the development of personalized therapies. The global companion diagnostics market is segmented on the basis of indication and geography. Based on indication, the global companion diagnostics market is classified into breast cancer, lung cancer, colorectal cancer, gastric cancer, melanoma, and others. The breast cancer segment, in terms of market revenue, led the global companion diagnostics market in 2012 and is predicted to maintain its dominant position till 2019. In the next few years, the lung cancer segment is predicted to expand rapidly, at more than 20.0% CAGR till 2019. Factors such as discovery of a myriad of related companion diagnostics and discovery of biomarkers relevant to lung cancer are expected to drive the lung cancer diagnostics segment during the forecast period. By geography, the global companion diagnostics market is divided into North America, Europe, Asia Pacific, and Rest of the World. 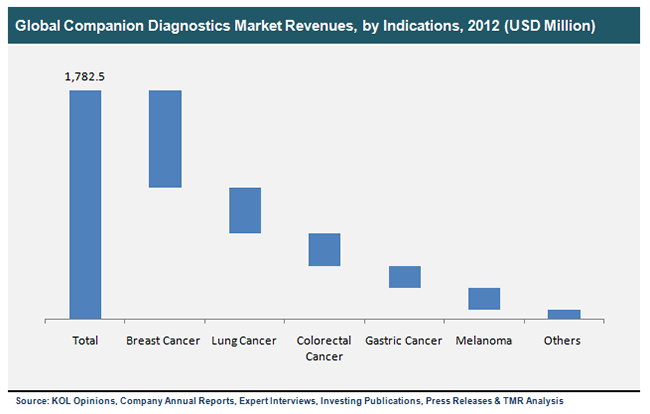 In 2012, the global companion diagnostics market was dominated by the North America region. North America held over 35% of the market in 2012. The Asia Pacific and Rest of the World regions are predicted to register faster growth in the next few years. The global companion diagnostics market is a competitive space and comprises leading players as well as emerging players. Some of the leading companies in the global companion diagnostics market are Quagen N.V., GE Healthcare Ltd, Abbott Laboratories, Roche Holdings AG, Agendia N.V., Life Technologies, Agilent Technologies, Inc., and Genomic Health. Factors such as an unfavorable reimbursement scenario, long-winded approval process of diagnostic technologies, lengthy development phases of diagnostic technologies, and increasing influence of advocacy groups and clinical societies are predicted to restrict the growth of the global companion diagnostics market during the forecast period.